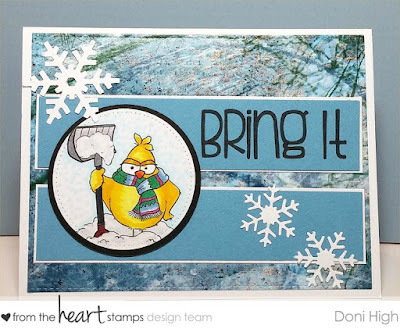 at From The Heart Stamps. Using the "Twist" and the "colors" are optional. I turned the sketch on it's side and used the twist "Snow Day". I used the really cute Birdbrain...Love the scarf! where I got it), I used My Favorite Things Die-namics Pierced circle stax and Snowflake dies. Wow, that's fantastic. I love the Background paper and the snowflakes! I would be very glad if you show it on my new challenge blog Do-Al(l) Kreatives. How fun! Love the snowflakes!! Too cute!